When it comes to footwear, we focus in particular on the perfect fit, a high level of functionality, a contemporary design, durability and technical innovation. We are not satisfied with second best. To live up to this high standard, we continuously involve alpinists and mountaineers from the LOWA athlete teams in the development process. They serve as experts, providing ideas and advice as well as testing the footwear under a wide variety of conditions. With over 90 years of innovation, LOWA developed and patented many exclusive technologies that make the boots not just safer, but also more durable and comfortable. Comfort and cushioning are further improved for specific uses with a complex injection-moulding process using a layering process. A sturdy wrap sole construction extending onto the upper ensures good stability. The anatomical shape of this carbon fibre insole wrapped in PU foam provides natural arch support that translates into a supportive fit and feel. A LOWA-exclusive development. Optimised PU foam (polyurethane) for outstanding cushioning and rebound attitudes. Our close-to-the-rock technology is designed to keep the distance between your foot and the rock as small as possible. Our close-to-the-ground technology has succeeded in optimally adjusting platform and stack height to further enhance safety. The integrated heel cushioning is set into the insole and results in more comfort and better rebound characteristics. This lightweight insole provides optimal flex in footwear for easy hiking and leisure use. Sturdy insole with an additional insulating layer for good stability on difficult terrain and protection from the cold at low temperatures. The “I-Core” carbon insert forms the intelligent core of the sole construction. Perfect flex and torsional stability are achieved with precision alignment of the carbon fibres with the lever arm for perfect flex, torsional stability, shock absorption and comfort. Upper construction with freely moving lace hooks and other components for a more individualized fit to better adapt to personal comfort needs. The shaft of the shoe moves “in sync” with the lower leg, thereby noticeably improving walking comfort. Easier ankle movement due to integrated “FlexZone” and flexible Lace Loop. Asymmetrical upper construction for synchronized movement of the boot’s shaft with the lower leg. Independently adjustable lacing zones, one on the forefoot and one on the upper, for an improved individualized fit and better adjustments for personal comfort and different foot anatomy. 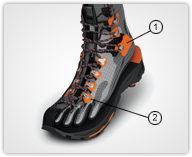 Exclusive patented LOWA locking cam hooks for totally comfortable positioning of laces within the 2 Zone system. The I-Lock system grabs the lace and holds it tight so the foot can be firmly held and supported while allowing for flexible shaft lacing. Pushing the hook clip upwards easily releases the clamping to loosen the instep lacing. Metal eyelets with small rollers to minimize friction and ensure easy lacing. This minimalist lacing system combines the highest performance with maximum weight reduction. The use of two laces enables adjustment at both the forefoot and rearfoot zones at the same time. Perfect tongue placement and fit with adjustable tongue construction for personal fine-tuning. A waterproof zipper protects from moisture and cold in extreme situations. For an easier instep we built in a zipper. Construction design minimizes the number of seams to prevent possible friction or pressure points. Adapted from climbing technology, the slingshot heel stems from the experience of perfect heel fit. The LOWA fit wing creates the ideal tensioning direction for more control at the heel. Highly breathable, durably waterproof lining material. Keeps feet pleasantly dry and offers optimized climate comfort for a broad range of outdoor activities. GORE-TEX® membrane with additional warm lining (100% polyester) keeps feet warm and dry during normal winter conditions. GORE-TEX® membrane with additional warm lining (80% polyester/20% wool) keeps feet warm and dry during cold weather. GORE-TEX® membrane with an insulating layer of lining ensures warm and dry feet during cold weather. The most premium synthetic insulation with a weight of 200g/m2 for warm feet in wintry conditions. The most premium synthetic insulation with a weight of 400g/m2 for warm feet in the extreme winter cold. LOWA uses soft, buttery Nappa leather from cows that are 1-1.5 mm thick. It is not dyed, therefore retaining its open pores. That means its ability to absorb water lies somewhere around 200 percent of its own weight. Its large capacity to absorb moisture, as well as the comfortable fit of a leather-lined boot, enables long and pleasant wear time while still while maintaining dry feet that don’t overheat. Occasionally on lengthy treks, for example over several days, one has to take extra care to allow sufficient drying time of a leather-lined boot. A fabric or synthetic lining makes footwear lightweight and breathable. Good abrasion resistance speaks for itself and ensures durability. In addition, it offers outstanding temperature management. When it comes to footwear linings, LOWA prides itself on a perfectly combined mix of polyester and polyamide materials. With that, we achieve a high level of comfort in our footwear based on the combination’s multi-faceted characteristics, including its ability to dissipate heat and moisture, a high abrasion-resistance and durability, as well as its pleasant hand feel.